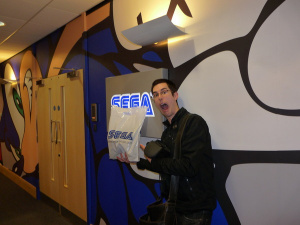 Strawberries and cream, Robinson’s fruit squash and appalling curly hair were all out in force for Sega Europe’s Masters Monday event, an invitation-only tournament with some of the best Virtua Tennis players on the circuit – and me – in anticipation of VT2009. There were even two guests of honour - Sumo Digital's Toby Allen and Kenton Fletcher, who were on hand to give some insights into the development of the first Virtua Tennis game for Wii. Sadly I was eliminated in the tournament's first round, but that just meant I got to spend more time with the nearly finished Wii build, nosing around its minigames, World Tour and training modes, and came away very impressed with what looks set to be the definitive tennis package on Wii. One of the main points the guys from Sumo were keen to press home was that the Wii version isn’t a cutdown port of its PS3 and 360 brethren, with all the online features and full career mode crammed into Nintendo’s white beauty. When playing online, you take your player into a tournament to compete for points, and as you gain points your ranking will improve, with the game auto-matching you against opponents without the need for those lovely Friend Codes. Although there was nobody to play against online, the range of tournaments, use of custom characters and ability to play nine minigames online mean it’s one of the most complete online experiences yet seen on Wii. 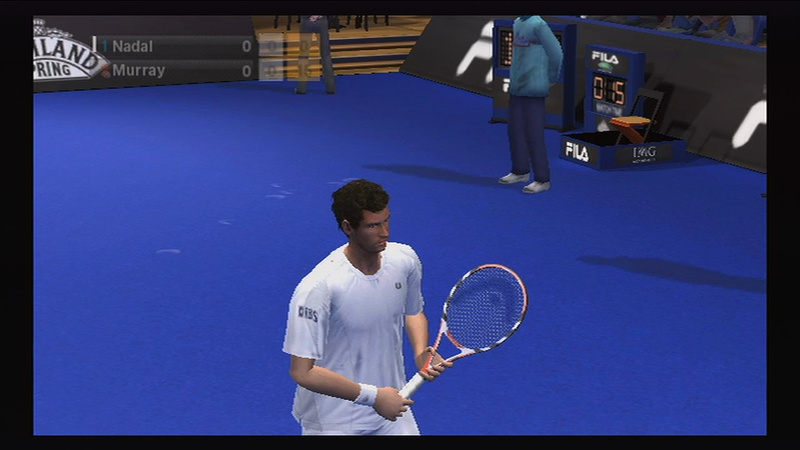 Starting your journey into World Tour mode sees you creating a custom character, who will be your in-game representative in all things Virtua Tennis. With a huge range of tweakable options using a series of buttons similar to creating Miis, it's not difficult to create a realistic lookalike or a complete freak, such as Toby's thick-chinned brute sporting a bright blue afro. As you progress through the game you can unlock extra items to brighten your character up a bit, from t-shirts to trainers, and there's even a mysterious "Lucky Dip" option that gives you the chance to win truly special prizes for a meagre investment. There's unlimited potential for a huge range of oddball characters, and I'm told there are even some secret characters hidden away in the career mode. Jumping into a quick game via the pleasingly large “play” button on the main menu, you choose one of over twenty players, although most players, including the Legends, are understandably locked at first. 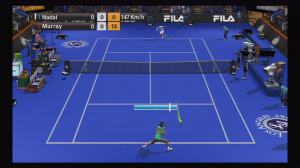 Within a minute or two you’re on the court, and starting to see what for me is the game’s best feature over previous tennis games – the aim assist bar. If you've seen any of the videos you'll be familiar with this red bar appearing over your player's head, which lets you know whereabouts your shots will land without the need for a cursor or buttons. It's the same system as Wii Sports and other tennis games on the system, but having the visual marker on screen means making those tough shots is made much easier. It can be switched off if you find it distracting, but it's certainly an innovative system that makes the game highly accessible. Andy Murray's big hair impressively rendered. Of course, the game's main innovation on Wii is the implementation of Wii MotionPlus to allow even greater control, although I have to admit it isn't the huge improvement I had expected, which just goes to show how well the standard Wii Remote controls work. The first thing I did notice was how difficult MotionPlus made serving, until Toby told me it was all down to how you hold the Remote - if you have it face up in the palm of your hand, you'll slice the ball without the need to twist it, for example. Once I grasped that, serving in particular became much easier as you start to use a wider range of movements to aim the ball into the corner of the court. It's a very pleasing feeling to hit a great serve across your body and see the ball spinning away from your opponent in a very realistic fashion. Toby and Kenton were keen to point out that they didn't try to implement the 1:1 MotionPlus feature that EA have been showing off in their upcoming Grand Slam Tennis, preferring to keep the game closer to its arcade roots. That approach certainly paid off, creating a fast-paced tennis game that gets very tense when in the longer rallies - I found myself holding my breath during a particularly competitive rally! With the aim assist bar it was easy to place shots exactly where I wanted them, and with the player's artificial intelligence automatically moving them, with the option to override it with the D-pad, I felt I had just the right level of control, even with the desperate passing shots. 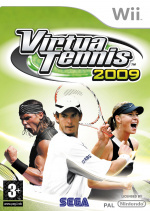 I came away very impressed with Virtua Tennis 2009, particularly with its full online modes and the comprehensive single-player World Tour mode too. Although we all know the Wii is most fun with friends, the opportunity to play online with anyone in the world is a huge boost to VT. With over twenty licensed players including the "legendary" Tim Henman (Sega's choice of adjective, not mine!) and so many more features - a full MotionPlus-based tutorial to master every kind of shot, different unlockable playstyles as you progress and fantastic motion-captured animation - anyone after an authentic and accessible take on tennis should certainly give VT2009 a look when it launches next month. Thanks again go to Joe and Martin at Sega and Kenton Fletcher and Toby Allen from Sumo Digital for hosting the event! Henman might not be legendary, but he was fun to watch. Now I'll have to stick with Andy Murray for the time being. Great hands-on report James. Fantastic read! Looks good. Interesting though, because GST has the arcade-y look and realistic controls, and VT has the realistic look and arcade-y controls. EA's getting my money. Nice report! But it's a bit weird that they decided not to make the controls 1:1 as this is the main selling point of MotionPlus! Aaarrrggghh, can't decide between this and EA. EA has my vote JUST at the moment! I think I've experienced the Arcade pace and control with Sega Superstars already so I guess I want something different in terms of that.Then again with WiiMotion plus it'd be remarkably different anyway. Brain-ache. release says may 19 in USA. Thats not right, is it? @Ren: Amazon lists it as being available on June 9th - one day before Grand Slam Tennis. @LEGEND MARIOID: YOU CANNOT BE SERIOUS! Grand Slam Tennis will have McEnroe! How can you even consider choosing any other tennis game over it?! It's either this or Grand Slam Tennis... I'm veering toward this at the moment. We shall wait and see for the reviews! If it's a choice between a Sega game and an EA game, I'd have to go with Sega every time. Sweet. Still torn between this and GS Tennis though. This just confirmed that I am definitely getting Grand Slam Tennis. I would rather have 1:1 controls. I'm gonna throw this out there and suggest that Sonic will be an unlockable player. If this game manage to match up with the PS3 and 360 version, I'm getting this instead of Grand Slam Tennis! I can trust Sega with this, as long the reviews are good thought. God...there are so many Wii and Wiiware games coming out! I need to get a second job so I can buy them all! I'll prolly still pass but I really like these first impression articles so keep them up~! 1:1 controls are certainly more exciting, but it remains to be seen if this is a good thing or not. I might just be satisfied if it registers backhand versus forehand, unlike Wii Sports Tennis, which just detects any sort of motion as a generic swing. This is tough because it'll be hard to go by reviews for something that is as new as 1:1 motion control, but I doubt both will be available to rent, either. Life is hard. I betcha that EA's game is better. As for the 1:1 issue, you still have plenty of control over shots and direction, and let's face it - if it was true 1:1, nobody would be able to win because I'm guessing very few of us are secret professional tennis pros. You get enough control with VT without feeling like the tiniest twitch will ruin your matches. @Lanafire7 - there are multiple angles although I didn't have chance to try them out. There's no need for buttons other than the d-pad - it's all based on how you swing. No sensitivity options that I saw but I didn't really dive into the settings screens. I just wanted to clear up the 1:1 issue - While this is something we're able to do, it won't give you a great game. This means that you will actually know how to play tennis and play it like a pro, I doubt many of us are in that position. We opted to keep the same mindset that VT has had over the years, and that's provide you with easy controls to pickup, but a lifetime to master. The Wii MotionPlus gives you a huge amount of control, and you're able to do everything you want to do with regards to the direction, power, types of shots and the overal reaction time/feel. The only real difference is that you don't see your character waving their rackets if your waggling and not really playing. Thanks for the insight Toby - you put it much better than I did! It's all very impressive seeing Grand Slam players spinning their racquets in their hands, but I doubt it'll make for an entertaining and intuitive sports game. Give me lions, pizzas and pirates any day! @MickEiA: Grand Slam Tennis has Lleyton Hewitt. @zane: Stefan Edberg and Bjorn Borg are in GST too. I haven't heard anything on Mats Wilander for either versions. Great information on VT 209 here! Toby (or anyone), can you elaborate on the MotionPlus calibration procedures for VT? I read somewhere that one has to re-calibrate the MotionPlus after every point, is that correct? MiamiHeat - at the start of each point you aim at your player and that resets the Motion+. Dead simple! Thanks, in your experience, does this calibration process seem to distract from, or affect, gameplay momentum? It's a necessary evil in my eyes - it could be irritating if you're playing with someone who keeps forgetting to do it, but as long as you pester your opponent it shouldn't get in the way too much. Lanafire7 - good find on the preview, Mike from Cubed3 was there on Monday and he's played it before, so he's got more experience with it than me. He seemed to like it even more the second time around, which is encouraging. As for the timing issue, I found it to be pretty well balanced, to be honest. If you swing too early your character won't wait to set up a shot - you'll just flail and miss. 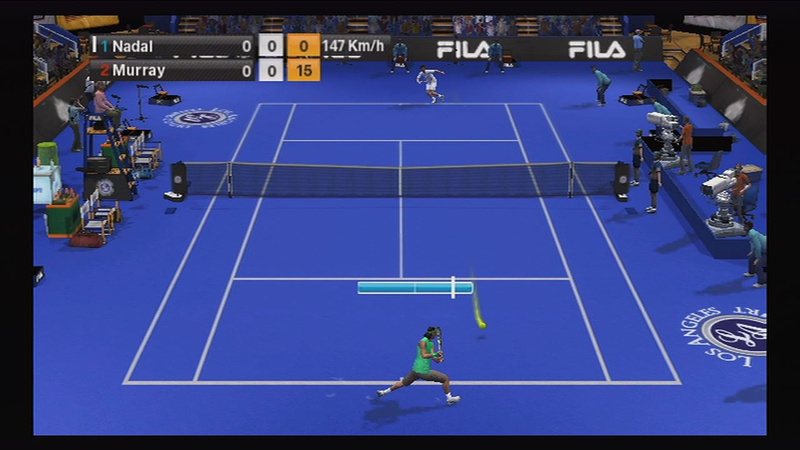 There's a short developer diary on the game's page here - http://wii.nintendolife.com/games/wii/virtua_tennis_2009. Try to spot NintendoLife commenter Zash007 in the opening minute!